Since its foundation in 2013, SANSARA has adopted a unique and innovative approach to programming. Rather than focusing on single composers or music from a particular era, our programmes explore thematic and textual links between pieces from the early Renaissance through to the present day, drawing on the often evocative associations they inspire. 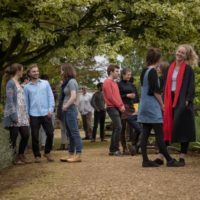 Through the juxtaposition of a broad range of musical styles and compositional practices, our programmes offer an eclectic presentation of choral music and its vividly human aesthetics. Cloths of Heaven is a programme of multiple and intertwined narratives that moves from darkness to light, towards optimism and hope for the future. In one sense, it is a Requiem that begins with Manuel Cardoso’s Introitus, from his own six-part Requiem Mass, and concludes with the radiant light of James MacMillan’s Lux aeterna, one of his Strathclyde Motets. The intervening music spans over four hundred years, beginning with two masters of the Renaissance. Nicolas Gombert’s poignant Lugebat David Absalon is framed by two contrasting works by William Byrd, Emendemus in melius and Memento homo, both from the Cantiones sacrae of 1575. This first group establishes the relationship between grief and hope that continues to weave its way through the programme. Rudolf Mauersberger’s Wie liegt die Stadt so wüst is a harrowingly beautiful piece, composed in 1945 in the wake of the Allied bombing of Dresden, where the composer lived and worked. The text, taken from the Lamentations of Jeremiah, could as easily be applied to cities caught in today’s wars, and this piece speaks as strongly to today’s conflicts as it does to those of the past. The tranquil beauty of Josef Rheinberger’s Abendlied reintroduces hope into a darkened place, ‘as evening shadows gather’. These two pieces are framed by a pair of chorale settings by J. S. Bach, Wie sich ein Vat’r erbamet (from BWV 17) and Leit uns mit deiner rechten Hand (from BWV 90). Concluding the first half of the disc, Gustav Holst’s impassioned Nunc Dimittis draws together the threads of the preceding pieces whilst looking forward towards the light of the second half. Works by living composers are always integral to our concert programmes and we are delighted to include six pieces by contemporary composers, five of which are recorded here for the first time. Cheryl Frances-Hoad’s O come, let us sing unto the Lord shares its core sentiment of vocal celebration with Gabriel Jackson’s Our flags are wafting in hope and grief, which sets poetry by Doris Kareva written in response to the Latvian Singing Revolution of the 1980s and ‘90s. This ‘voicing of freedom’ is followed by Marco Galvani’s effervescent setting of the medieval hymn, Tantum ergo, based on the original chant melody. Written specially for this recording, Malcolm Archer’s Cloths of Heaven sets W. B. Yeats’ beautiful text with characteristic sensitivity and warmth. These stable harmonies are followed by the glistening dissonances of Oliver Tarney’s A Prayer of St Richard of Chichester, also written for the choir. The album concludes with another Requiem text, the Lux aeterna. James MacMillan’s setting presents the original plainchant melody in the altos, grounding the piece firmly in the European choral tradition. Just as the Lux aeterna chant weaves its way through this final piece, so have the threads of narrative woven through the whole disc, their distinct musical voices coming together in a programme which explores the darker sides of human experience, but that is ultimately optimistic for the future. 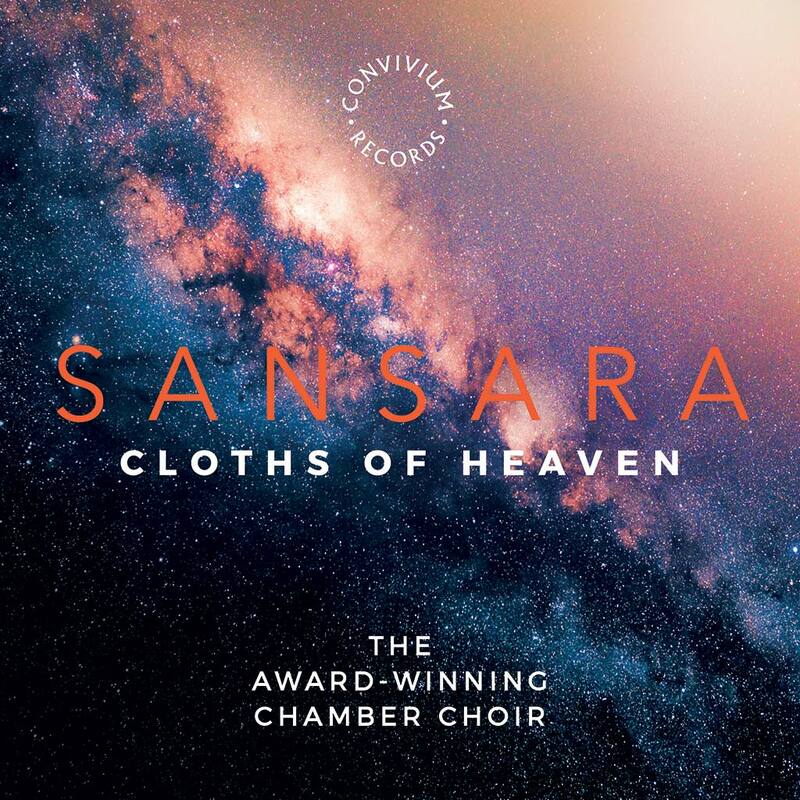 SANSARA is an award-winning vocal ensemble focused on the performance of a cappella choral music. As a collective body of voices, a choir is a living, breathing instrument with unparalleled expressive potential. 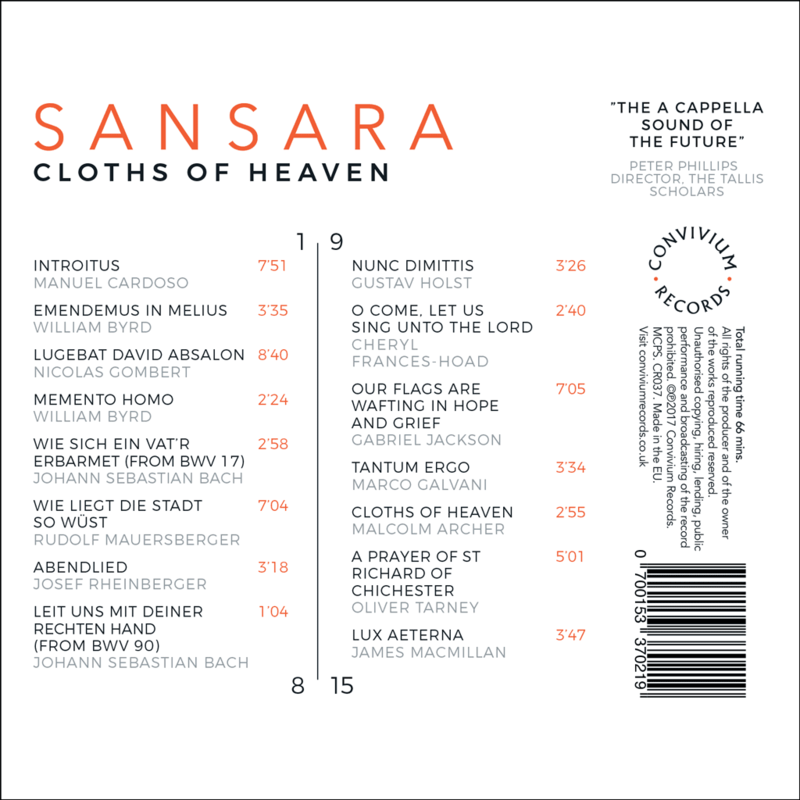 Sansara realises this through direct and honest music-making, always striving to conjure compelling atmospheres, communicating with clarity and integrity. SANSARA works as a chamber ensemble without a single director or conductor. The result is a highly engaging and versatile group of professional musicians, working together with a unified voice to express a shared artistic vision. The choir has rapidly gained a reputation for captivating performances of a broad range of repertoire, juxtaposing choral music old and new in vivid narrative programmes, tying thematic and textual links into rich musical-poetic live experiences.